I guess it’s time to do a post about some manga. It’s only natural considering how much I read! This post goes to the overwhelming popularity of two manga about weird teachers touching the lives of students. This year, Assassination Classroom and Denpa Kyoushi took over their respectives magazines. 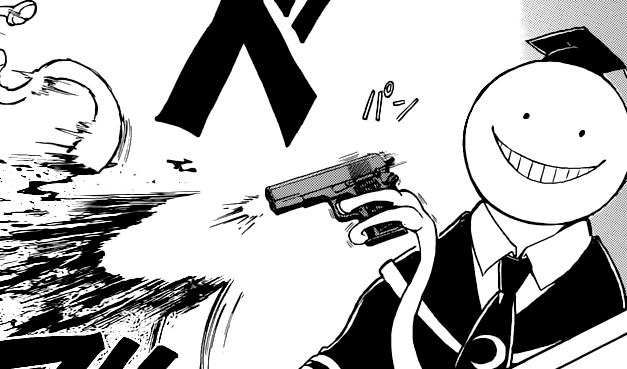 Assassination Classroom emerged guns blazing – literally and figuratively – as Weekly Shonen Jump’s new big hit, whilst Denpa Kyoushi conquered the ranks of Weekly Shonen Sunday. My guess: vintage never fades. Much like in fashion, recycling of story concepts is bound to happen at some point. There are only so many ideas that would work for shonen manga and the one people love most is the weird/quirky teacher. Both series are growing stronger. They’re popularity shows and they are delivering entertaining chapters. Let’s see if we get some anime adaptations out of them sometime soon.